This post was first published on positively.com and is reprinted here with permission. Here is the second of three articles based on excerpts from my next book - out soon! - Essential Skills for your Growly but Brilliant Family Dog, Book 1: Why is my dog so growly? - which points out an area which will be affecting your dog mightily. Read the first excerpt here. While you’re doing your best to improve the situation and you take a look at what may be making things worse, you cannot overlook stress. Here’s another area of your dog’s life that may be building stress that may surprise you. This one floors so many people! Adult dogs need to sleep 17 hours a day for mental and physical stability. 17 hours a day! Is your dog getting anywhere near 17 hours a day? If your dog paces and runs, chews and barks, jumps and dives, plays and chases all the time at home, he is not living the carefree life you may imagine! I have seen the dramatic improvements that result from getting this one right. The ability to switch off, to relax and restore, is much sought after by people with enormously busy schedules and responsibilities. The most successful build naps and quiet time into their day as a matter of course - and that downtime is inviolable! They have learnt its importance. Teaching your dog how to switch off is essential to his mental wellbeing. Some dogs don’t need to learn this! Cricket the Whippet is happy to spend 22 hours a day under a duvet, reserving her activity for mealtimes and short bursts of awe-inspiring speed. But she has an even temperament and no hang-ups over other dogs or people. Nothing even startles her! But it’s a sure bet that your reactive and anxious dog will keep pacing and worrying and staying on guard-duty all day, unless rest-time is enforced. If ever a dog needed its rest and restorative sleep, it’s the growly, fearful, or reactive dog. Think how you feel when you’re short of sleep and have a challenging day ahead with the family, or at work! You start off on a short fuse, and that may get shorter as the day goes on. Ensuring your dog gets enough downtime is critically important. It’s often at the root of her troubles. Once she’s getting enough restorative sleep she’ll be better able to cope with all the trials and tribulations of life. 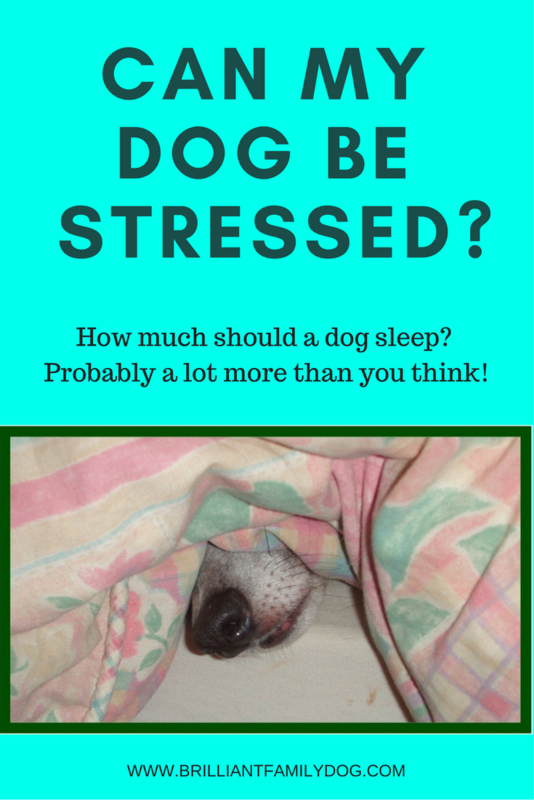 As indicated above, dogs need a massive 17 hours of sleep a day for optimal stresslessness. Is your dog getting anything like that? If not, you need to help him into a comfortable routine which does not involve endless pacing and activity. While I was there, it became clear that this hyperactive dog was wearing himself out. For the first twenty minutes of my visit he never stopped. He raced in and out of the room, jumped up my front, my back, chewed my hair, poked the other dog, ran off again, paced … never rested. So I quickly amended my training plan to include some relaxation work straight away. After some active games to get Tim to engage with me, I started teaching him to slow down and relax. After just five minutes of this, his owner expressed amazement at seeing her frantic dog actually lying down still for more than ten seconds at a time! Nope. He just slid onto the floor beside us, and as he lay there his head started to loll, his eyelids drooped, and he was … asleep! To the total astonishment of his owner, who had never seen him sleep in the day. Want to know what I did to achieve this blissful calm state? See the first book in the Essential Skills for a Brilliant Family Dog series: Calm Down! Step-by-Step to a Calm, Relaxed, and Brilliant Family Dog (free at all e-book stores) to get the exact program. Quite apart from the usefulness of this skill for any dog, anywhere, your reactive dog will hugely benefit. Watchpoint: teaching calm and relaxation is not teaching a stay exercise (although you will get a solid stay as a result) with the traditional stern shouting and finger-waving. The object is quite different - to change your dog’s mental state, not to anchor his physical position. Learning how to switch off can also help with Separation Anxiety. And, of course, your dog will be better able to cope with the challenges he’ll meet outdoors if his nerves aren’t jangling. Did you find this excerpt interesting? Here's what Book 2 will look like! I have a new puppy: will I ever get any sleep again? “Designer Dogs”: what are they really made of?